Rather than write my usual monthly update, I think it’s important to look forward to the event in terms of speakers, lunch, pitches, venue and more. Rather than write my usual monthly update looking at what has been done, I think it’s important to look forward to the event and tell everyone what to expect in terms of speakers, lunch, pitches, venue and more. We’re going to have an awesome day hearing from experts in the fields of public transit, affordable housing, police reform, community building, land use policy and more. Our venue at 86 Miller is not your typical conference space, it’s a auto body shop turned art gallery. With the big garage door, we’ll be letting some sunshine in while we hear from our speakers. I’m going to be real with everyone: I don’t like events that start too early or misrepresent when the speakers actually start. Especially on a weekend when every moment under the covers should be treasured. So here’s the straight facts: Doors will open at 8:30 am for a light breakfast (muffins, bagels, coffee and juice) at our 86 Miller Street venue, but the speakers will begin at 9:30 am. 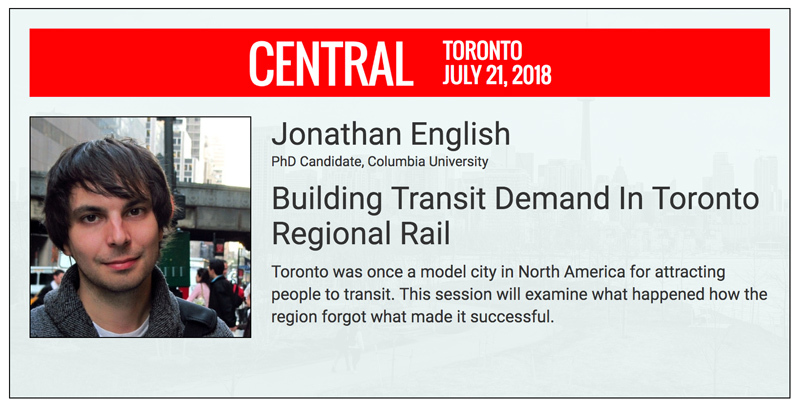 After a quick introduction by me, we’ll get on with our first speaker, Jonathan English, a PhD Candidate from Columbia University, presenting an analysis of regional rail in Greater Toronto. Going from the macro vision of Toronto to the micro, our second speaker is Ilana Altman from The Bentway. 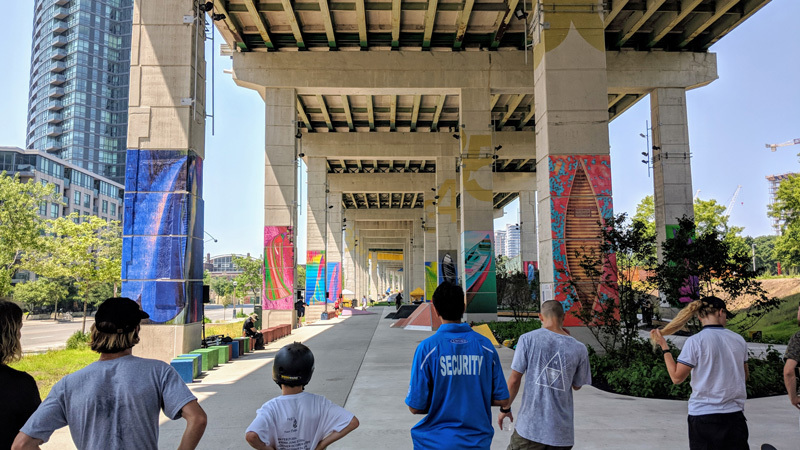 The Bentway is an amazing project to create public space underneath the elevated Gardiner Expressway that cuts through downtown Toronto. Following Ilana, we’ll have a series of quick pitches from our partners Our Greenway, Alzheimer Society of Toronto, and The Laneway Project about how you can get involved in the initiatives that are changing Toronto for the better. Our Greenway is a proposed 21-kilometer roadside linear park network across Toronto’s suburban northwest, support a range of personal and commercial mobility devices. The Alzheimer Society of Toronto will be presenting their Dementia-Safe Communities initiative with the goal of educating the city so that our neighbourhoods are places where people living with dementia and their care partners feel valued and empowered. The Laneway Project has the goal to transform laneways into vibrant spaces, that are alive with arts and culture, commerce, recreation and community. Rather than do catering, we’ll be breaking for lunch and letting everyone find their favourite food in the neighbourhood. 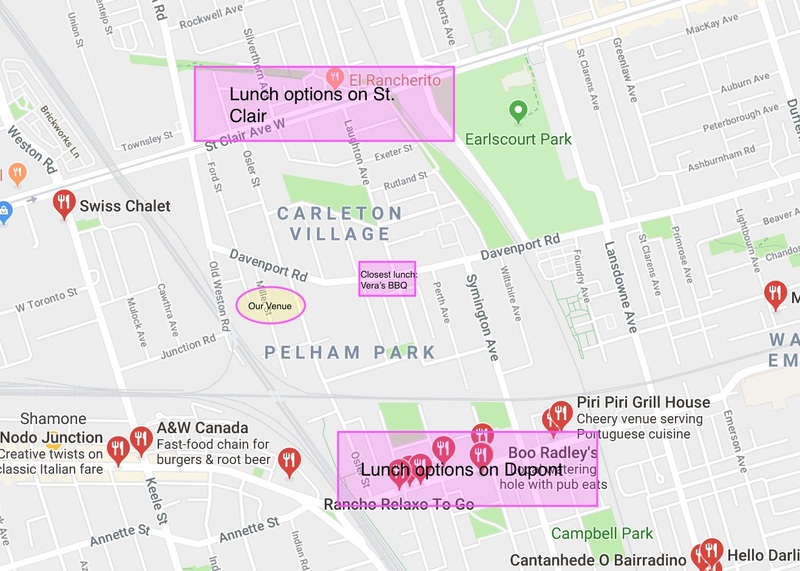 It’s about a 10 minute walk north to St. Clair or south to Dupont. Once you hit either street, you’re likely to find something you like. It looks like St. Clair has more Asian options while Dupont has some fancier North American fare. For those that don’t want to walk far, Vera’s BBQ is a quick jog around the corner for Portuguese chicken meals. When we reconvene, we’ll hear from another two expert speakers on important topics: police reform and land use policy. Julius Haag, a PhD Candidate at University of Toronto, will focus on how Toronto’s police force needs to adapt to maintain public trust and make a real impact on crime. He’s been vocal on Twitter about the Toronto Anti-Violence Intervention Strategy (TAVIS), carding practices, and the recent decision by the new Ontario Conservative government to put police overview reforms on hold. 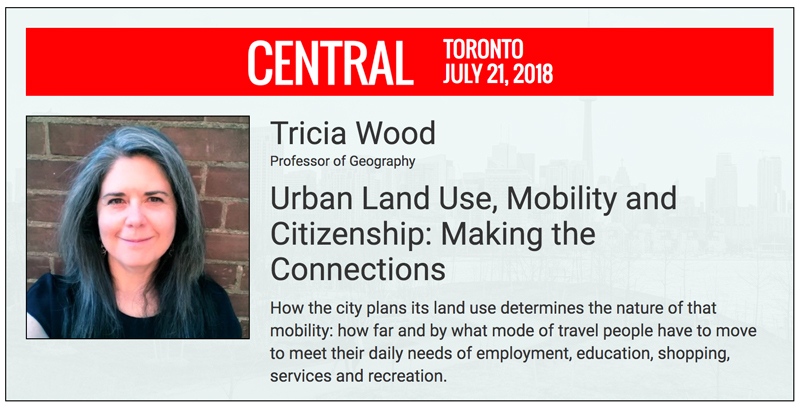 Tricia Wood is a Professor of Geography at York University. Her session will focus on how the city is designed to allow people to move, whether on food, bike or in a vehicle and the opportunities that this design gives to some groups of people and not others. We’ll have a quick break to stretch our legs and get some refreshments at this point. Embracing change in the city is definitely going to be a theme for the day. The King Street transit pilot project is one such change that some people have had trouble getting on board for. That’s where Kevin Vuong’s King Street Eats group came in. King Street Eats is grassroots movement to show support for both the pilot project and restaurants along the route. The initiative has sparked conversation with city councillors, transit users and business owners. 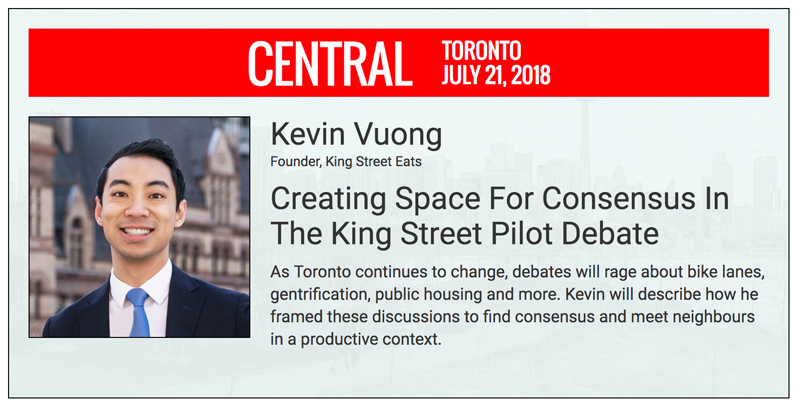 He’ll describe the impact that such engagement can have on making and holding onto important progress in Toronto. Our next speaker is Cheryll Case. 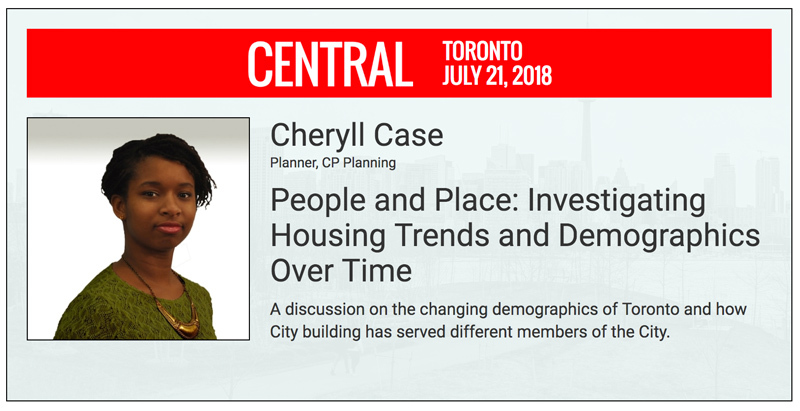 She is a planner focused on affordable housing, and her session will focus on demographic trends related to population movement within the city. Meaning who is moving where and why. Some of Cheryll’s previous writings have focused on the trend called overhousing, where some parts of the city are shrinking in terms of population, while others are booming. Our only panel of the day is focused on making housing affordable in Greater Toronto. Housing is perhaps the most contentious issue in our city as market forces, concern for personal wealth, government programs, transportation, and unique community concerns mesh together. Our confirmed panelists include architect Naama Blonder, planner Gil Meslin and we’ll be having a new moderator from Evergreen, still to be confirmed. Finally, Evergreen will be closing out the day with an overview about how they believe cities can flourish in the coming decade. I think it’s safe to say we’ll be retiring to a nearby establishment to relax after a jam-packed day. Tickets are still available through Eventbrite. Ticket prices will be increasing on July 7 - two weeks out from the event - so get yours now! I hope to see you all day on July 21!